As your business grows, both the risks and reward become greater. Horton offers coverage that can suit your business today, tomorrow and in the future. The Horton Group provides more business insurance to more industrial gas and welding supply distributors than any other independent insurance agency in the U.S.
As your operations grow, both the risks and rewards become greater. Understanding that your business' longevity depends on the choices made today is crucial to maintaining relevance in such a competitive atmosphere. The Welding Distributors Partnering Group (WDPG) is recognized as the premier business insurance program serving the welding and gas industry since 1987. The Horton Group has extensive experience delivering innovative business insurance and risk management solutions to welding & gas distributors throughout the United States. We serve GAWDA, IWDC, AIWD and other members of the gas & welding supply industry from coast-to-coast, both distributors and suppliers. 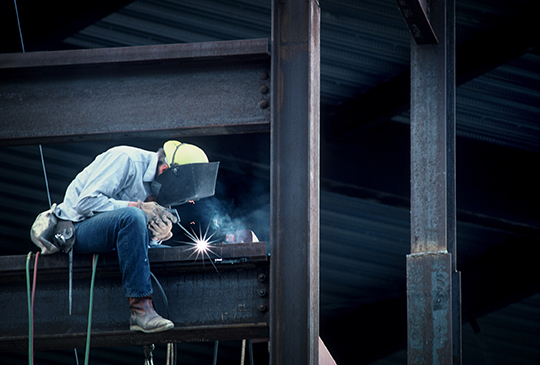 The welding supply and gas distributor industry is full of risk and potential liabilities. Selecting insurance limits can often times be challenging and nerve-racking, especially in your industry, as it forces you to predict the future. Selecting the wrong limits could put you out of business or in a bad financial situation. We have the ability to conduct a peer analysis, benchmark limits against distributors of similar size and recommend limits which are difficult for distributors to select on their own. "Tony Hopkins is our agent and he and the Horton Group are very involved with welding distributors and the IWDC, specifically. Tony has spoke at IWDC events and I have found him to be very knowledgeable when dealing with the big gas companies regarding contract language, specifically indemnity issues. His insight was invaluable during our last negotiation, which helped us to get fair language in our contract." - John Dunfee, President of WELD Specialty Gas & Equipment, Inc.
"Horton has been our agent for over 25 years and has become an invaluable part of our organization. We know we can count on The Horton Group to be there when we need them. Our service team has dedicated themselves to the success of our business and the entire industry. With memberships in GAWDA, AIWD, ISBT and AWS, Horton has a comprehensive understanding of the industry and always puts the needs of their clients first." "I have been involved in risk management in our industry since 1996. I have had the privilege of working with Horton over the past twelve years and it’s clear that they know our industry well. In addition to the traditional insurance coverages that they negotiate on AWG’s behalf, they always keep us updated on industry trends and help us with our acquisitions, contracts, safety policies, and cost efficient ways to decrease our risk. They are truly part of our risk management team!" - Chuck Beal, Vice President & Associate General Counsel of American Welding & Gas, Inc.
What lies ahead? What issues should you be prepared for? The more you know about what lies ahead, the more you can prepare for tomorrow. Be prepared to find risks and opportunities by following emerging trends. From continued political gridlock to rising healthcare costs, know what matters in 2019 and beyond. As unemployment falls, baby boomers near retirement, and many industries experience a shortage for skilled labor in many trades - a war for talent is underway. With an opportunity to attract and retain employees, benefits plays a key role in boosting employee loyalty. But with increasing benefits, employers also think they have to increase costs. Maybe not. Maybe there is a better way to recognize the different preferences of each generation of employee and design a program that not only is cost effective, but gets to the heart of what is most important for them. Are employees driving their own vehicles a business risk?